But why is it called Cholera? I know, the name is off-putting. But it probably doesn't refer to the disease at all, instead denoting the Walliser dialect word for coal (Chola or Cholu), or the baking hut itself (Cholära). More on the traditional Walliser Cholera, and where the name came from, here. 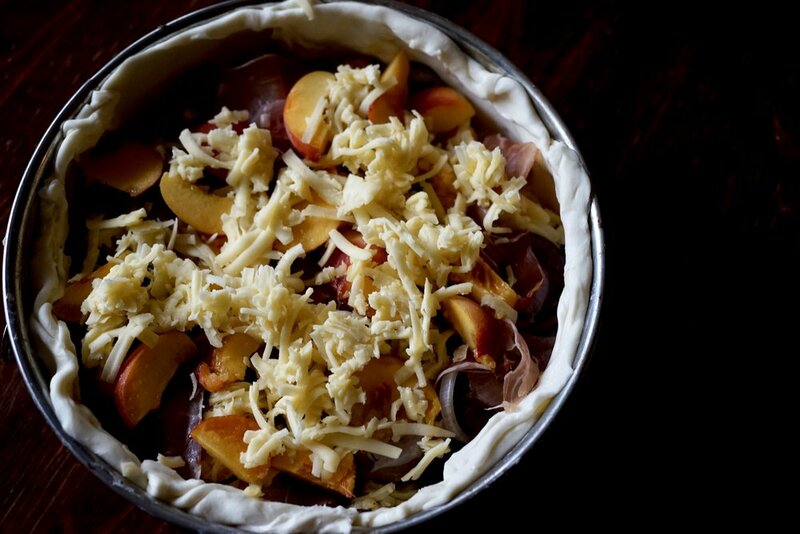 This version of the pie still marries fruit, meat, and cheese, but is ever so slightly lighter by forgoing the potatoes. Preheat the oven to 180 C / 350 F / gas mark 4. Line the bottom of a 26 cm (10 inch) springform pan with parchment paper. Line the pan with the rolled out dough, reserving a bit (around 50 g) to make the lattice top. Keep the tart shell cool (preferably in the freezer) until you have the filling ready. In a medium pan, melt the butter until spluttering. Add the onion and fry for about 7 minutes or until softened. Remove from pan and let cool. Using the same pan, quickly fry the bacon until it is a bit crispy. Let cool. Although it depends on how thinly everything is sliced, you should be able to get in at least two sets of layers. Once you run out of filling, or make it to the top, use the remaining puff pastry to make a simple lattice top, pressing it down around the edges. 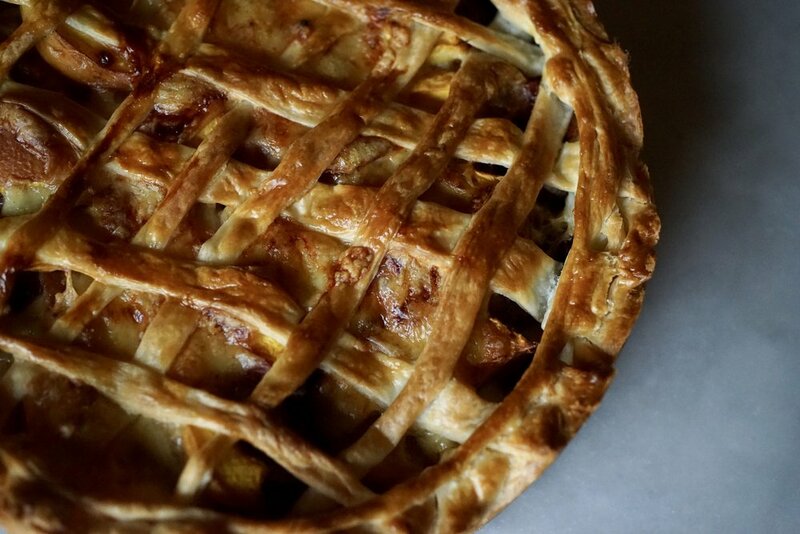 In a separate dish, whisk together the egg and a pinch of salt, then brush the top of the pie. Bake for about 30-40 minutes, or until the top is golden. Raclette is the classic, but other hard cheeses—Gruyère, Appenzeller, Cheddar—would also do. I used Bauernspeck, which does not need to be cooked first, so I skipped the frying part.